Transit • The building blitz will slow for foreseeable future, with focus on gradually increasing service. 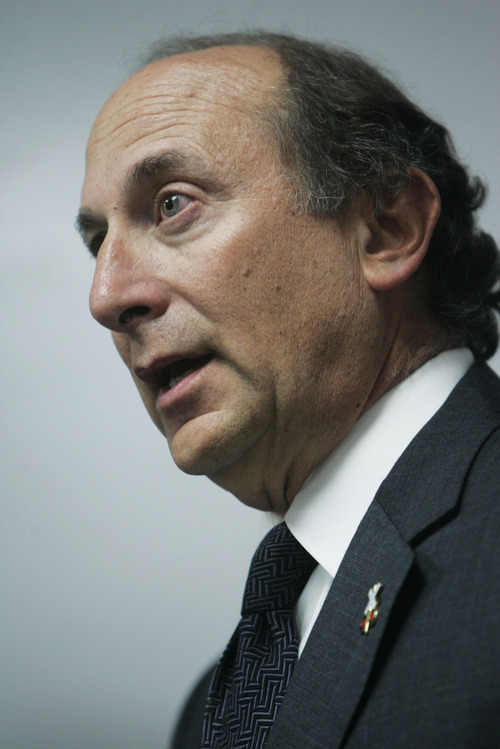 Utah Transit Authority General Manager Michael Allegra took 41 trips in the last 18 months, including seven abroad. He says the travel is all work -- not junkets. UTA spent more than $610,000 on travel during the period examined. This file photo shows Allegra last winter at UTA headquarters in Salt Lake City. 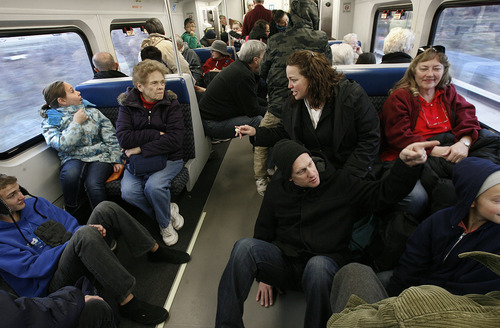 Scott Sommerdorf | Tribune file photo Rob Jones, seated on floor, and Lori Jones, above him, talk with other riders as they took the free ride from Provo to Salt Lake City on the new FrontRunner train on Saturday. Regular service began Monday and complaints about the new line -- from broken ticket machines to late trains and glitchy Wi-Fi -- are plentiful. 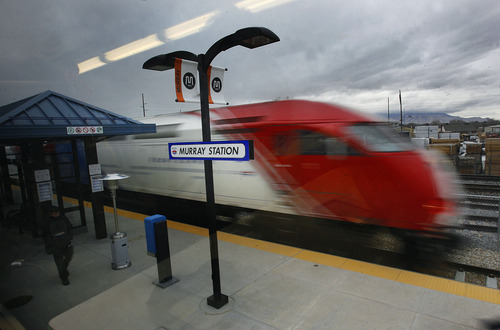 Scott Sommerdorf | The Salt Lake Tribune A FrontRunner train leaves the Murray Station on its way to Salt Lake City. 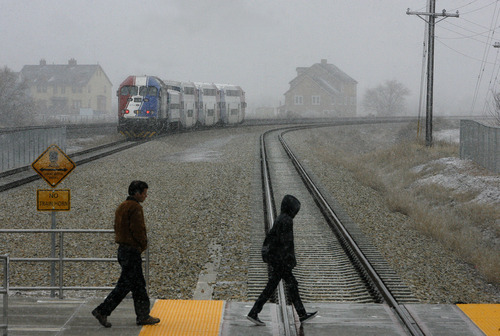 The FrontRunner line linking Provo and Salt Lake City was opened in December. Scott Sommerdorf | Tribune file photo A TRAX train passes West Valley City Hall as it leaves the West Valley Central Station on the newly opened green line in August 2011. The schedule of the new train line won't cover the early or late flights to and from Salt Lake City International Airport. Scott Sommerdorf | The Salt Lake Tribune Riders cross the tracks as they disembark at the Murray Station after their ride from Provo Saturday, December 8, 2012, as the southbound train can be seen leaving for Provo. The public was invited to ride the new FrontRunner line linking Provo and Salt Lake City starting at 10 a.m. 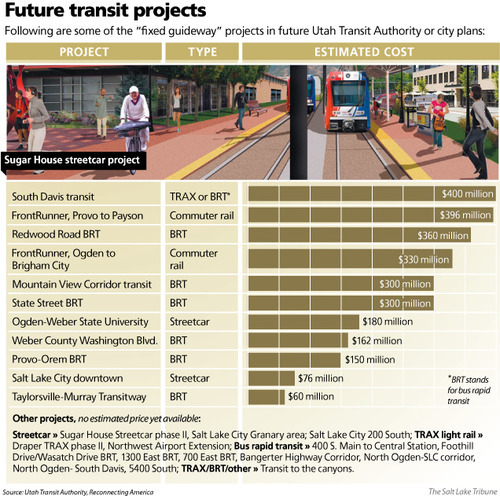 The Utah Transit Authority just finished, or will complete in coming months, $2.4 billion worth of new projects: TRAX lines to South Jordan, West Valley City, Salt Lake City International Airport and Draper, a FrontRunner line to Provo and the Sugar House streetcar. What&apos;s next after the build-out blitz? UTA wants to "restore some of the service that has been cut," says spokesman Gerry Carpenter. Sales taxes  which provide 71 percent of UTA&apos;s revenue  took a dive when the recession hit, just as the big projects began. The UTA now receives about $80 million less in sales tax than it had projected for 2013 when the projects were planned. To make ends meet, UTA made cuts in night and weekend service, plus reducing or reworking bus routes. As a consequence, for example, when the airport TRAX line opens in April, tight budgets will not allow UTA to run it early enough to service some morning flights, or late enough for the last several arriving night flights  and the transit gap will be worse on weekends. While providing more frequent service is UTA&apos;s next top priority, Chief Planning Officer Matt Sibul says the agency also has many more construction projects in various phases of design  but first "we are going after low-hanging fruit" with less expensive strategies. That includes focusing on "bus rapid-transit" lines, or sort of a TRAX on rubber tires that avoids the cost of rail construction. It&apos;s all part of achieving what UTA General Manager Mike Allegra says is UTA&apos;s two-part grand vision for the future: First, having a major transit stop within a mile of 90 percent of the Wasatch Front&apos;s population; and, second, having a bus or train come every 15 minutes all day long. "That would do away with the need for printed schedules because service would be so frequent," Allegra says. He also wants short trips to be so cheap "that there will be a pass in every pocket." UTA is moving toward that by planning "distance-based" fares on TRAX and buses, instead of flat fees for trips of any length. It says that change could come as soon as the next year or two. Over the longer term, by 2020, it also hopes to move to a cash-free fare system, requiring passes or pre-purchased cards to ride. Increased frequency • Sibul says UTA has been studying what its next step should be after the current expansion projects are complete. He said what jumped out most "is amping up the 15-minute services that connect" the new lines more frequently, to boost their usefulness to riders. Such integration, he said, will help "really make those work and feed off each other better." Carpenter said that as the economy improves and generates more sales tax and fares, UTA will be constantly looking at which routes and times of day could benefit most from more frequent service  and target those first. But the changes could come slowly and gradually. "We are comfortable and confident we have the funds to operate the system we&apos;ve built, but there isn&apos;t a lot of room in our current budgets and our current plan to dramatically increase our services. We do have plans to moderately increase some services," Carpenter said. For example, he said UTA found demand for the FrontRunner commuter train is higher than expected after its new extension from Salt Lake City to Provo opened. So it announced this week it is adding trains during peak hours and doubling the window when trains are available to every 30 minutes instead of every hour. UTA isn&apos;t just waiting for sales-tax revenue to climb to invest in service improvements, but is actively seeking ways to stretch its current money. Among the efforts Carpenter describes is an attempt to partner with the University of Utah, Salt Lake City and the Chamber of Commerce to run additional trains between the central business district and the U. He notes a similar partnership with Park City and Summit County helped create a new bus service connection with Salt Lake City. UTA is looking at working with more school districts, too, said Jerry Benson, UTA chief operating officer. About a third of Salt Lake City School District students who ride buses to school now use UTA routes, and he said more partnerships could save taxpayers from buying extra buses at the same time it generates more revenue for UTA. Low-hanging fruit • While UTA may focus more on trying to increase frequency, it also is continuing to plan many new projects. Sibul says most of the focus is on cheaper projects like "bus rapid transit," where buses may have their own dedicated lanes on busy highways. Passengers buy tickets from machines before they board; buses have more doors, more frequent runs and fewer stops; and buses have limited ability to change traffic signals in their favor. UTA has one such line now on 3500 South in West Valley City, although only about a mile has special bus-only lanes. UTA is looking at such lines soon between Provo and Orem, from Taylorsville to Murray and along Redwood Road and the Mountain View Corridor in western Salt Lake County. More are in planning stages throughout the Wasatch Front. "They have really low capital costs, but really high ridership," said Chad Eccles, transit program manager for the Mountainland Association of Governments, a group of local governments that plans transportation in Utah, Wasatch and Summit counties. "Those are what people want to see now." He said a bus route now from Utah Valley University to Brigham Young University to downtown Provo carries more than 4,000 riders a day. It will soon be converted into bus rapid transit with bus-only dedicated lanes for about half of its route, and ridership is expected to increase significantly. Eccles said at relatively low cost, it will get more cars off the road, better connect UVU and BYU, and serve as a collector for FrontRunner stops in Orem and Provo. Sibul said UTA is also looking at a cheaper form of bus rapid transit, called "bus plus," that has all the same features except for the bus-only dedicated lane. He said they could add such lanes over time, but could start more cheaply and provide most of the benefits sooner. Several future BRT lines may start that way. More expensive projects • UTA also has plans for more expensive extensions of TRAX, FrontRunner and streetcars. But it may be some time before it can afford to build them. For example, the current TRAX line to Sandy  which will extend to Draper later this year  is envisioned eventually to go around the Point of the Mountain to Lehi and continue all the way to Orem. Sean Seager, director of regional planning for Mountainland, says northern Utah County has become a magnet to new high-tech companies and homes, and demand is high for more mass transit there. The new Adobe building in Lehi was even built to accommodate a future TRAX station on site. UTA and Salt Lake City are looking at extending streetcar lines to the University of Utah and around downtown. UTA is studying a streetcar or TRAX extension into Davis County, and FrontRunner extensions to Brigham City and Payson. Ogden and UTA are interested in a streetcar from downtown Ogden to Weber State University. 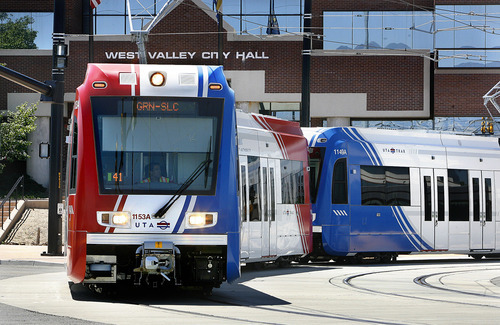 UTA is also looking at TRAX, bus rapid transit or other alternatives to the Wasatch canyons. UTA Board Chairman Greg Hughes says UTA even might use tunnels from old mines to connect Park City with mass transit up Big and Little Cottonwood canyons. But such plans would cost billions and likely take decades. And federal money for them is dwindling. But Carpenter notes UTA built much of its recent projects with no federal funds, including the FrontRunner line to Provo and the TRAX lines to the airport and West Valley City. The TRAX line to South Jordan received 80 percent of its funding from the federal government, the Draper extension has 60 percent federal funding, and the Sugar House streetcar is getting 50 percent of its money from Washington. Amid tightening federal dollars, Carpenter said UTA will seek more partnerships with local governments to put it in a better position to compete for any federal grants that are available. He noted, for example, that the agency teamed with Salt Lake City and South Salt Lake to each provide about a third of the required local match to win grants for the Sugar House streetcar. To show the importance of partnerships or self-funding, the research group Reconnecting America last month issued a report saying transit agencies nationally have about 500 fixed-guideway projects in various stages of design and planning. It says at current levels of federal funding, it would take 78 years to build them all. Jockeying for federal funds, says Sibul, is "super competitive right now."